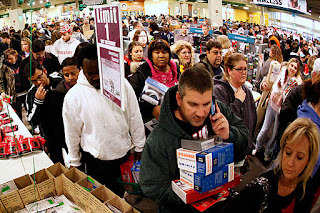 Black Friday is a chaotic time for shoppers, trying to find the sporadic good deals in the haystack of mediocre deals. I recommend Slickdeals for that. But beyond finding the best deal, there are ways to make the most of your shopping. First, decide which credit card you want to use for your spending. If I'm buying electronics that I think I'll keep for more than a year, I will usually put it on either my Premier Rewards Gold or Starwood Preferred Guest American Express card. American Express has a very customer-friendly one year of Extended Warranty that is automatically added to all purchases. Additionally, you get 90 days of Purchase Protection against theft and accidental damage. So instead of spending that extra $200 on an extended warranty for your laptop or LED TV, put it on your AMEX. If you're doing shopping in a department store, I recommend using a card like the Chase Freedom card, which for Q4 2011 is giving 5 points per dollar for dining, department stores, charitable organizations, and movie theaters. Additionally, if you have a Chase Checking account, you'll get a 10% bonus on points and an extra 10 points per transaction! If you get a great deal for a suit for $200, you'll get more than 1100 UR points, worth about $22. Second, decide how you want to shop. While there are probably some good deals in brick & mortar stores, that requires a lot of effort, elbowing through crowds, and waiting in lines at early hours. I'll probably do the majority of my shopping online. That way, I can earn points or cashback by using shopping portals. A good resource to see what kind of cashback you can get for any online store is evreward. You type in whatever site you plan on shopping from, whether it be Macy's, Barnes & Noble, or Best Buy. It will provide a comparison of various cashback links, often between 5-15%, for just clicking through their link. These cashback links are separate and in addition to any cashback that you get from your credit card! So if you find a cashback link for 8% and you use a Chase Freedom card, you will get 8% + 5% back! The second online resource I plan to use is the Ultimate Rewards Shopping Mall. Before shopping at any online store, I check to see what the UR Mall is offering for that store. Yesterday, they offered 20 bonus Ultimate Rewards points per dollar spent, which is essentially 20% cashback! Best Buy will be offering 10 bonus points per dollar spent, so if you buy a MacBook Air for $1000, you'll get 11,000 UR points, worth about $220. Main takeaways: bring several credit cards when doing your shopping, and choose wisely when deciding which one to use. Try to do some of the shopping online, avoiding hassle and benefiting from additional cashback from shopping portals!